Acclaimed New York Times-bestselling picture book creator Michael Hall delivers a funny and suspenseful story about colors, ants, aardvarks, and rainbows that will appeal to Lois Ehlert fans and fans of The Very Hungry Caterpillar, by Eric Carle. Another winner from the author of My Heart Is Like a Zoo, Perfect Square, and Cat Tale! Five carpenter ants at home in their tree stump hear a noise. What is it? One ant thinks it is a hungry aardvark lurking outside the stump, just waiting to eat them. One ant makes a hole in the stump to see. Orange light floods the stump—it's not an aardvark, proclaims the ant chorus. It's orange! So what is lurking outside the stump? This very funny picture book features die-cut holes on almost every page, suspenseful page turns, a wonderful surprise ending, and an introduction to a rainbow of colors. 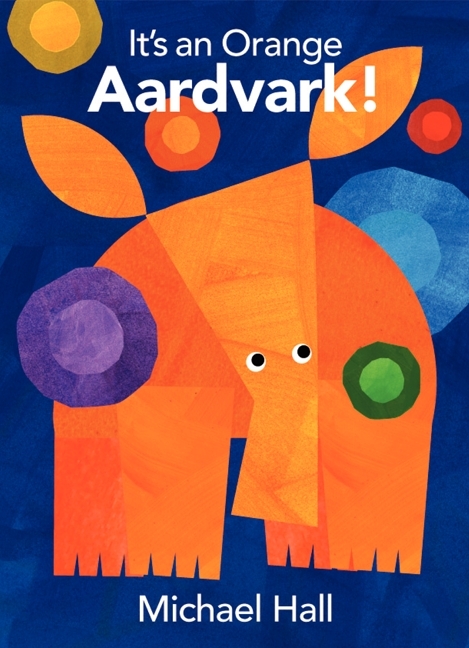 It's an Orange Aardvark! is a tour de force for Michael Hall, the acclaimed and bestselling creator of My Heart Is Like a Zoo, Perfect Square, and Cat Tale. Recognize common types of text. Identify who is talking at various points in the story. Read common high-frequency words by sight (color words). Use knowledge of language and its conventions when writing, speaking, reading, or listening (interjections).